Real tooth,so each of them may slightly different. 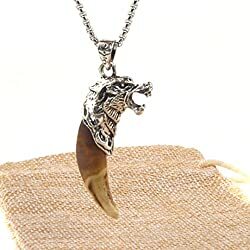 Pendant size:5.5 x 2.5 CM Wolf head material: alloy 22 inches long surgical stainless steel necklace (rounded box chain style) Including a beautiful gift box printed with Brand Name "HZMAN". In case you buy it as a gift - you may be sure it looks nice.